I’ve been reading a lot of books about naturalists who have been on great expeditions: Alexander von Humboldt, Charles Darwin, Joseph Banks and the like. 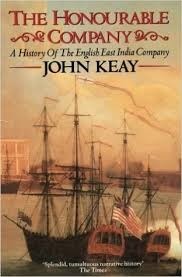 This book, The Honourable Company by John Keay, is a bit of a diversion into great expeditions for commercial purposes. Such expeditions form the context, and “infrastructure” in which scientific expeditions take place. The book is a history of the English East India Company, founded in the early 17th century with a charter from the English sovereign to conduct trade in the Far East (China, Japan, Java) and India. It is somewhat chastening to realise the merchants had been exploring the world for one hundred years (and the Spanish and Portuguese for nearer 200 years) before the scientific missions really got going in the 18th century. The book is divided into four parts each covering periods of between 40 and 80 years, within each part there is a further subdivision into geographical areas: the East India Company had interests at one time or another from Java, Japan and China in the Far East to Calcutta, Bombay and Surat in India to Mocha in the Middle East. The East India Company was chartered in 1600, following the pattern of the (slightly) earlier Muscovy and Levant Companies which sought a North West passage to the Far East and trade with Turkey respectively. At the time the Spanish and Portuguese were dominating long distant trade routes. The Dutch East India Company was formed shortly after the English, and would go on to be rather more successful. The Company offered investors the opportunity to combine together to fund a ship on a commercial journey. The British Crown gave the Company exclusive rights to arrange such trade expeditions. Initially the aim was to bring back lucrative spices from the Far East, in practice the trade shifted to India initially and in its later years, to China and the import of tea. The Dutch were more military assertive in the Far East where spices like nutmeg and pepper were sourced. Once again I’m struck by the amount of death involved in long distance expeditions. It seems western Europeans had been projecting themselves across the oceans with 50% mortality rates from sometime in the early 16th century to the end of the 18th century. For the East India company, many of their factors – the local representatives – were to die in their placements of tropical diseases. In the early years investors bought into individual expeditions with successive expeditions effectively competing with each other for trade, this was unproductive and subsequently investment was in the Company as a whole. Although it is worth noting that even in the later years of the Company in India the different outposts in Madras, Bombay and so forth were not averse to acting independently and even in opposition to each others will, if not interests. Alongside the Company’s official trade the employee’s engaged in a great deal of unofficial activity for their own profit, this was known as the “country trade”. The East India Company’s activities in India led to the British colonisation of the country. For a long time the Company made a fairly good effort at not being an invading force, basically seeing it as being bad for trade. This changed during the first half of the 18th century where the Company became increasingly drawn into military action and political intrigue either with local leaders against third parties or in proxy battles with other European powers with which the home country was at war. Ultimately this lead to the decline of the Company since the British Government saw them acting increasingly as a colonial power and saw this as their purview. This was enacted in law through the Regulating Act in 1773 and East India Company Act of 1784 which introduced a Board of Control overseeing the Company’s activities in India. Keay is very much focussed on the activities of the Company, the records it kept and previous histories, so it is a little difficult to discern what the locals would have made of the Company. He comments that there has been a tendency to draw a continuous thread from the early trading activities of the Company to British India in the mid-19th century and onwards but seems to feel these links are over-emphasised. India is the main focus of the book despite the importance of China, tea and the opium trade in the later years which is covered only briefly in the last few pages. I must admit I found the array of places and characters a bit overwhelming at times, not helped by my slightly vague sense of Indian geography. Its certainly a fascinating subject and it was nice to step outside my normal reading.